I didn’t see Farm Aid either. Not sure why. It was in September, so I probably wasn’t away. It aired on The Nashville Network, which we may not have received in Canada at that time, and so it is possible that it wasn’t even possible for me to see it. I really have no memory of it at all. 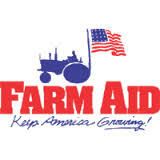 Farm Aid, which has now become an annual event, was initially organized by Willie Nelson, John Mellencamp, and Neil Young after Bob Dylan made an off-hand remark about struggling family farmers at Live Aid in July. 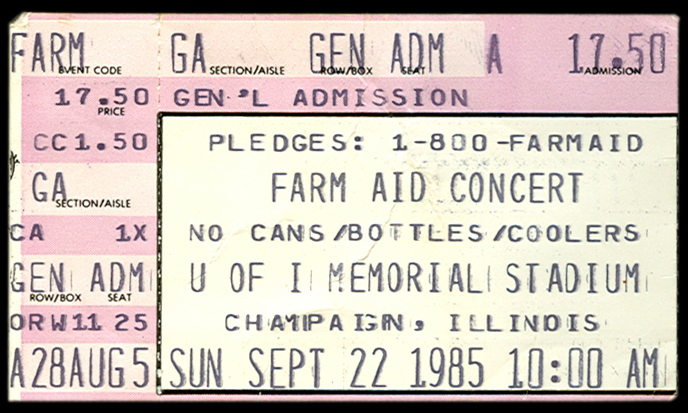 The whole thing was brought together quickly in Champaign, IL, and it featured a remarkable list of musicians, most of whom had been left off an event like Live Aid. Obviously, country acts dominated (Alabama, Johnny Cash, Charlie Daniels Band, John Denver, Vince Gill, Merle Haggard, Emmylou Harris, Waylon Jennings, George Jones, Kris Kristofferson, Loretta Lynn, Roger Miller, Charley Pride, Kenny Rogers, Tanya Tucker, to name but a few), but there were also blues stars (B.B. King! ), rock stars (Eddie Van Halen! Sammy Hagar! ), pop stars (Billy Joel! Daryl Hall! ), and people who you would think had never seen a farm in their entire lives (Lou Reed!). Perhaps most bizarrely, there was LA-based punk band X. There is obviously a connection there that I am unaware of, since they also played Farm Aid II the next year. 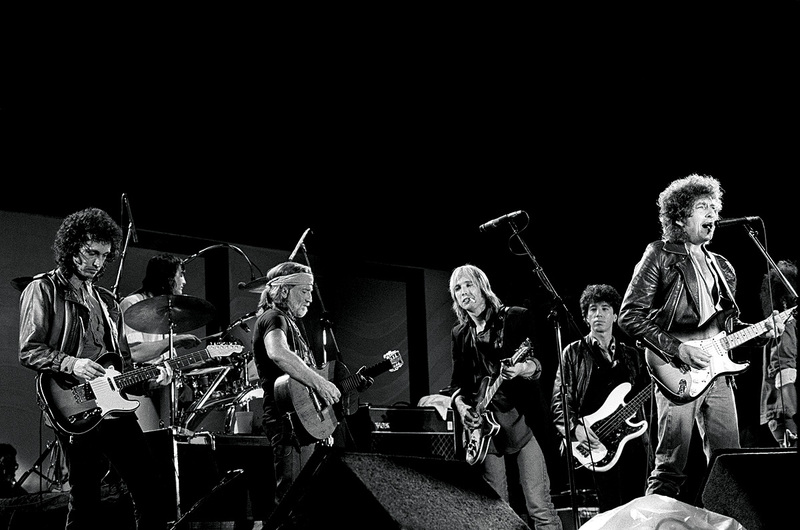 I believe that this show marked the first time that Dylan performed live with Tom Petty and the Heartbreakers, with whom he would tour in 1986 and, more impressively, 1987. While I don’t want to get ahead of myself, many argue that those tours were the return of “good Bob”, with him working with a well-established unit for the first time since The Band a decade earlier. We shall see. The Farm Aid set wasn’t flawless, but it was miles better than Live Aid. It was really the complete opposite of the Live Aid set – a big band sound rather than the acoustic trio; mostly new songs rather than obscure old ones. Dylan performed six songs, and three of them were from Empire Burlesque (“Clean Cut Kid”, “I’ll Remember You”, and “Trust Yourself”). Of those only “Trust Yourself” sounds like a significant upgrade on the album version. He also performed “Shake”, a song that his website claims is his own, but for which no lyrics are provided – I’m not sure where this fits into things. It was possibly a new composition that didn’t get used for anything. “That Lucky Old Sun” is a standard by Beasley Smith and Haven Gillespie that had been covered by the like of Jerry Lee Lewis, Sam Cooke, Ray Charles, Aretha Franklin, and Willie Nelson. I’m not sure where Dylan is borrowing it from, but it could be any of them. I like this version, although like most of the set it is a bit overdone (the combination of Heartbreakers and back-up singers can become overwhelming). Finally, he ended his set with “Maggie’s Farm”, providing the kind of crowd-pleasing thematically-appropriate hit that he couldn’t bring himself to deliver at Live Aid. This is a nice version – not as powerful as many from the 1970s – but solid and pleasing. The tempo is great. Dylan Personal Life Invasion Trivia: The woman Dylan sings “I’ll Remember You” and “Trust Yourself” with in the video above is Madelyn Quebec (formerly a Raelette), who is the mother of one of his back-up singers (Carolyn Dennis). At this show Dennis would have been pregnant with Dylan’s sixth child, and she and Dylan will marry in 1986. So that is Dylan singing with his future mother-in-law.